The last few weeks have seen new releases by some of the biggest names in what is still called Indie music. Radiohead, REM, PJ Harvey, Elbow and er, Bright Eyes, have all got offerings for us. Some of them are bound to be a disappointment, no matter what the press tells us. After all, how can Elbow keep producing records of such quality, and especially now everyone’s looking at them? As for REM, well, I listened to “Automatic For The People” the other day and anyone who says they’ve made anything even a fifth as good since is a barefaced liar. First up, Radiohead. Yes, I know PJ Harvey’s record was out weeks ago but I still can’t face listening to it (long story). I’ve criticised Radiohead’s jazz electronica direction previously, largely with the complaint that they just aren’t very good at it. Would “The King Of Limbs” be their long-awaited return to the guitar rock that made their name? Of course you know the answer. The record’s been out for ages, you’ve heard it, read all the views. My take on it? They still aren’t making records that are particularly good. I’ve got no issue with bands being challenging – go and listen to last week’s tip The Psychic Paramount if you doubt me on this – but I just don’t find myself being drawn back to listening to Radiohead’s records. Yes, I can fully agree how great it is that a Big Rock Band have truly, wholeheartedly, and successfully changed their sound to be more adventurous than their peers. It’s great that they still sell out properly big venues whilst playing tunes that aren’t exactly easy on the ear1. But you know, even after listening to The King Of Limbs a good number of times2, I still can’t say I’m particularly enjoying it. What’s missing are the hooks, the little catchy bits that stick their hooks into your craw and drag you back in for just one more listen. Doesn’t matter what instruments you do it on; Sam Amidon does it on an old acoustic, Russian Circles do it on looped guitars, Tortoise do it on f- knows what, but they all have something that claws at your soul until you have to give in. For me, Radiohead don’t. Maybe it’s just me. Maybe a few more listens will get me slathering and gibbering for just one more listen. Maybe. Anyway, for the next week or so I’m going to finally get round to listening to PJ Harvey, get stuck into Elbow, and listen to REM with a sense that a once-great band can still write the occasional great song, but they’ll never recreate their glory years. Cynical? Me? Coincidences, eh? Just last night I was listening to PJ Harvey’s duet with uber-miserabalist multimillionaire Thom Yorke1 “This Mess We’re In” and wondering firstly what a great voice she’s got, and secondly wondering when those moany wonders Radiohead will get round to releasing another record2. And lo! On Valentine’s Day, they’ve only gone and told us that the new record is out Saturday. Saturday! That’s this Saturday! You can do that when you’ve got no record label and gazillions of fans. ‘Tis called The King Of Limbs and it’s available for pre-sale now at the bargain price of £6 for a 320K MP3, with some more expensive options like double 10” vinyl and gubbins for £30. No word yet on what the thing sounds like. Guess you’ll just have to wait. To keep you going, and also to celebrate PJ Harvey’s new record (which I will really, honestly, truly write about soon, once I’ve listened to it), here’s that lovely song. It’s almost appropriate for Valentine’s Day too, if your idea of romance is a torrid encounter in New York with someone you really shouldn’t be having a torrid encounter with. 1 The saying “Money can’t buy you happiness, but it can buy you a better class of misery” springs to mind here. 2 And yes, whether it’d be any good or not. Let’s save that thought. 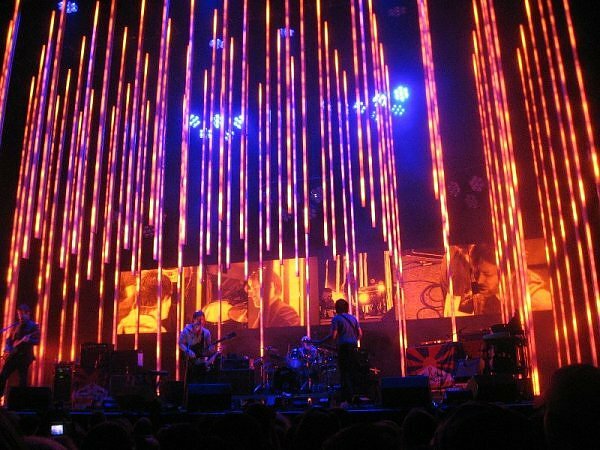 The other week, I was listening to a live Radiohead show from Seville. A number of thoughts struck me. The first was that, on form, they are an astonishing live band. To be able to replicate intricate, neo-jazz-dub-funk-rock numbers like “15-Step” live, and to do it well, shows that they are superlative musicians. Second, that people who talk during rock shows should be shot. 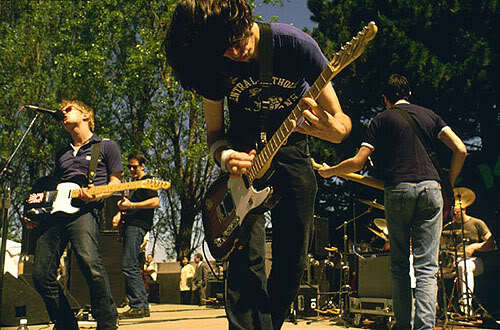 But the main, overriding thought about them was, “I wish they would stop thinking they are Autechre meets Pink Floyd”. Because, since OK Computer, I’ve found them a hard band to love. And I know that this just isn’t the agreed alt-rock opinion, but frankly very little they have done since then has been great music. Sure, it’s been interesting, fascinating, and sometimes bewildering, but it’s not music that sits in your head. There’s precious little emotion, except of the We-Are-All-Doomed variety. When they do get back to their guitar roots, such as during “There There” or “Wolf At The Door”, they suddenly make sense again, and you remember what made them the greatest rock band of the 90’s. And it seems like I’m right up against those arbiters of indiedom, Pitchfork. In their Top Albums of the 2000’s list, Radiohead’s “Kid A” comes top1. What, better than Yankee Hotel Foxtrot? Or You Forgot It In People? Yellow House? It’s not that I’m against established rock bands experimenting, far from it. And I’m certainly not against bands being different – albums such as Boredom’s “Vision Creation Newsun” and Tortoise’s “Standards” are two of my top records of the Naughties – but there’s something about Radiohead’s last four albums that don’t just work for me. It’s immensely frustrating watching a brave, hugely talented band trying something different and finding that it doesn’t quite work. Even more frustrating to find most other people praising them to high heaven, rather than looking back and going “Hold on, this sounds just like something Aphex Twin would reject for not being good enough”. Maybe it’s just me being cloth-eared. Who knows? Ok, so maybe I’ll have a Damascene conversion one day, scales dropping from my eyes as I declare “Kid A” to be the Eighth Wonder Of The World, but somehow I doubt it. In the meantime I’ll be that moany bloke in the corner who says “Ooh, why don’t they play their guitars a bit more these days? These electronic beats is making my ears hurt” whilst everyone else is enjoying themselves to “I Will”2. *Of course, they are still pretty good now. I’m just messing with you. 1 Which brings me to another point – The Avalanches at number 10? Seriously? I liked them as much as the next man back in 2000, but let’s just say they got old quick and really haven’t recovered. 2 I wonder if anyone has ever enjoyed themselves to that song? No, me neither. Gosh, I’m a miserable sod today. It’s the drizzle. Always brings out the maudlin in me.